DreamHack Open Tours 2018 is upon us and there’s no doubt that the tournament itself will be quite eventful. We might not see a lot of famous teams but even the underdogs can upset the natural order of things. We’ve seen it happen many times and a couple of the teams participating in the DreamHack Open Tours 2018 haven’t had a lot of success in Major tournaments. However, no opponent should be underestimated as even the least-skilled teams can cause major surprises. So, what can we expect from this tournament? Well, it’s too early to make certain predictions but if you take a look at the teams, there could be a clear indication of who’s going to move forward and who will be stopped during the group stage. Let’s take a look at the what’s and when’s of this tournament! The DreamHack Marseille tournament will be divided into 2 parts: group stage and playoffs. In the groupstage we will see the 8 teams separated into 2 groups, from which the two highest placed teams will advance into the playoffs. The group stage games will be played in bo1 format with a two double-elimination (GSL) format groups, if a decider match is needed will be played on bo3. Starting from the playoffs, all games will be bo3 on a single bracket elimination. 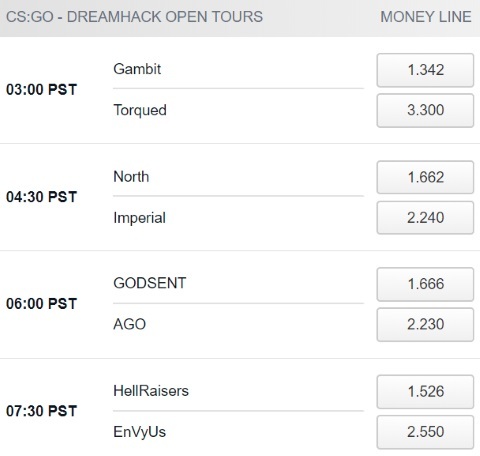 Below, you can see the schedule and the results of the DreamHack Tours 2018. We’re in for a pretty open tournament because most of these teams are rather close in terms of performance, skill, team play, etc. The bookies are slowly preparing proper bets and if you want to be in on the prediction so it’s easier for you to make a choice, stay up to date by following our website. It’s a good idea you stay tuned for what they’re planning to do since you might make the correct choice and end up winning some of your bets! Live streaming is a major part of eSports tournaments and we’ll make sure you can watch a stream for this tournament down below!